Ancestor is a word we hear a lot in Odinism. At seasonal blots and at special rituals such as a Naming, Profession or Bael we hear it and hopefully within your home you hear this term as well. So what does this word mean and why is it so important? The definition of ancestor is: someone from whom a person is descended; forerunner or predecessor. From these definitions we see that there can be different types of ancestors, although some may encompass both. There are our literal blood relatives whose dna shape our being. Those who make up the unbroken physical line from which we came to be. Our grandparents and great grandparents back into time unmemorable. More than likely you have heard of this definition. We honor these ancestors whose strength and courage, whose victories and defeats, whose good decisions and bad, have molded and shaped the people we are today. We owe to them our very existence and in very real ways they are ourselves. In ancient times the honoring of one’s ancestors was an important component in the lives of the descendants. There was a duty each to the other that held high importance. The living were expected to remember and respect the dead, sometimes even laying out a dumb supper or burning incense in their honor. The dead in turn were expected to bless, advise and look after the living. In this way the connection remained strong and was not forgotten as is so often the case in modern times. Now many people go through life as rootless trees, having forgotten those who came before, they are therefore left defenseless against the winds that blow back and forth in life’s struggles having no strength to anchor themselves to and draw from. 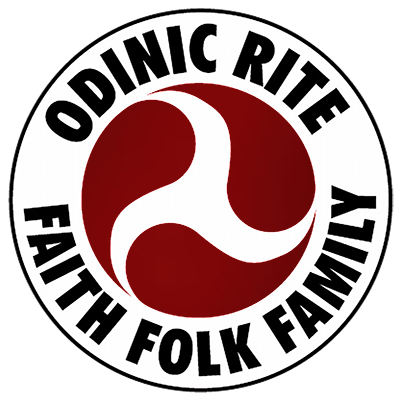 In Odinism we remember those who came before and the connection we have with them. It strengthens us and we can derive wisdom from the generations past. We also remember to look forward to those who will come after us and look at how we can live our lives to better theirs. However, there is another often overlooked type of ancestor and that is our spiritual ancestor. These are those, known and unknown who paved the way for us spiritually. They are the heroes sung and unsung who held fast to their Folk religion in the onslaught of the encroaching desert faith or those who pushed and waded through centuries of alien indoctrination to reclaim the old faith of their homeland, of their people and to work for the new awakening of our Folk. These ancestors we derive strength, courage and wisdom from as well. We look to their lives and examples and are able to know that we are not alone. Just as we are not alone in our bloodline, we are not alone in our faith and never have been. There has always been a line of those who remained true to the Gods, even when it seemed daunting and seemed lonely they could look back and know others had walked the same road and they could look forward and know that someone would follow. Hail the ancestors, blood and spirit! This thread is an exampe, Acorn Hollow is not just a resource for our children but an inspiration to us all.